Meet Joseph Atchison, Lead Accountant here at WestCMR. Joseph handles oversight of daily transaction processing, ensuring the accuracy of entries to ledger accounts. He strives for continuous improvement within the accounting department facing each challenge with a WestCMR Global “Show Them!” attitude. Joseph has been with WestCMR for almost 1 year. 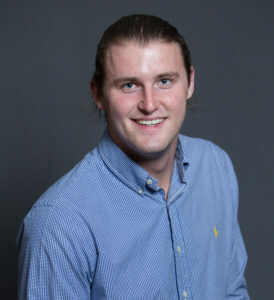 He joined the team as a staff accountant after graduating from Southern Arkansas University with a dual-degree in Finance and Accounting. Joseph is a dual citizen of Germany and The United States of America. He was born and raised in Texarkana, Texas. He’s a lover of international cuisine. Before you started working at WestCMR, what did you think happened to surgical supplies sitting in hospital stock rooms if they were never used? What surprised you most about the surplus surgical supplies issue? Without much thought on the subject prior to working at WestCMR, I believed most surplus surgical supplies would either be returned to the manufacturer, donated, or destroyed upon obsolescence. The most surprising aspect is the amount of surplus supplies out there that is perfectly viable and losing value – WestCMR provides an efficient and fiscally responsible solution to this issue. Tell us three reasons why you would recommend someone to consider a career at WestCMR. WestCMR exemplifies the values that act as the foundation for our daily operations – Respect, Initiative, Gratitude, Honesty, and Teamwork (RIGHT). WestCMR makes helping others a priority by dedicating time and resources, and we are always looking for new philanthropic initiatives to become involved in. WestCMR provides employees with incredible benefits and boasts a great work/life balance.